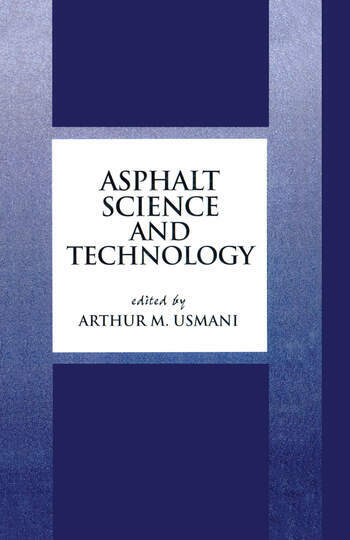 "Offers comprehensive, authoritative coverage of the chemistry, technology, and engineering of asphaltic products for paving, road construction, roofing, coatings, adhesives, and batteries. Analyzes microcracking and elucidates the mechanisms of degradation to aid the development of hot melt asphalt and increase longevity." "Characterization of Asphalt Asphalt Chemistry: An NMR Investigation of the Benzylic Hydrogens and Oxidation, P. W. Jennings, Jacqueline Fonnesbeck, Jennifer Smith, and J. A. S. Pribanic Molecular Motions and Rheological Properties of Asphalts: An NMR Study, Daniel A. Netzel, Francis P. Miknis, J. Calhoun Wallace, Jr., Clinton H. Butcher, and Kenneth P. Thomas DSC Studies of Asphalts and Asphalt Components, Thomas F. Turner and Jan F. Branthaver Detection of Strongly Acidic Compounds in Extensively Aged Asphalts, Sang-Soo Kim, Gerald W. Gardner, John F. McKay, Raymond E. Robertson, and Jan F. Branthaver Oxidation of Asphalt Fractions, Jinmo Huang Reduction of Odor from Hot Asphalt, Peter Kalinger, Robert J. Booth, and Ralph M. Paroli Mechanical Rheological Aspects Propagation and Healing of Microcracks in Asphalt Concrete and Their Contributions to Fatigue, Dallas N. Little, Robert L. Lytton, Devon Williams, and Y. Richard Kim Polymer Modifiers for Improved Performance of Asphaltic Mixtures, Heshmet A. Aglan Effect of SBS Polymer Modification on the Low-Temperature Cracking of Asphalt Pavements, Robert Q. Kluttz and Raj Dongré Rheological Properties of Polymer-Modified Asphalt Binders, Peter E. Sebaaly Polymer Modifications Current and Potential Applications of Asphalt-Containing Materials, Arthur M. Usmani Amorphous Polyalphaolefins (APAOs) as Performance Improvers in Asphalt-Containing Materials, Andrés Sustic Chemistry and Technology of SBS Modifiers, Elio Diani, Mauro Da Via, and Maria Grazia Cavaliere Polychloroprene-Modified Aqueous Asphalt Emulsion: Use in Roofs and Roads, S. S. Newaz and M. Matner Polymer Science and Technology, Arthur M. Usmani Factors Influencing Compounding of Constitutents in Bitumen-Polymer Compositions, Janusz Zielinski Development and Characterization of Asphalt Modifiers from Agrobased Resin, Sangita, I. R. Arya, R. Chandra, and Sandeep Polymer Network Formation in Asphalt Modification, Arthur M. Usmani Production, Identification, and Application of Crumb Rubber Modifiers for Asphalt Pavements, Michael Wm. Rouse Asphalt Coatings and Mastics for Roofing and Waterproofing, Eileen M. Dutton Performance-Modification Relationships Polymer-Modified Asphalt Cement Used in the Road Construction Industry: Basic Principles, Bernard Brule Performance Characteristics of Asphalt Concrete Mixes Containing Conventional and Modified Asphalt Binders, Akhtarhusein A. Tayebali, John Harvey, Alejandro J. Tanco, Robert N. Doty, and Carl L. Monismith Analytical Approach to Bitumen-Polymer Blends, Patrick Cogneau "
"The book is recommended to anyone with interest in asphalt and especially in asphalt modified with polymers. It is well-illustrated and written. "